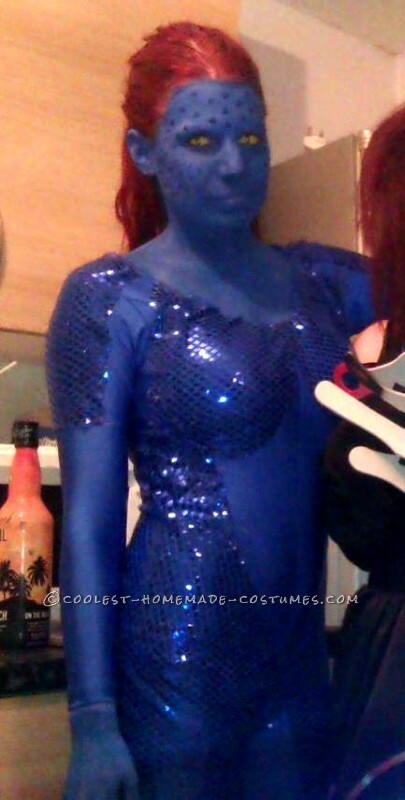 I thoroughly enjoyed coming up with the design to complete this Mystique costume. I decided to scrap the body paint idea (it’s cold outside) and just use a unitard instead. I chose to use sequinned material to add the scales effect. I cut and attached this while wearing the unitard which probably sounds just as hard as it was. But still fun all the same. I deliberately chose a darker blue for the sequins and had different shades of blue face paint to create the perfect color to match the bodysuit. After I used latex to create the scale look on my face, I painted my face and anywhere else that could still be seen as normal human color. Then, I defined the scales by painting a darker blue to match the sequins. I used cat eye contacts and already had red hair so it was perfect, all that was left was the gelled look and voila! The creepiest costume anyone had ever seen that night! A lot of fun getting right into character!